Protection Review's Jo Miller gives us an overview the recent Syndicate Research. The Syndicate is the research proposition run by Protection Review, with membership open to all, with the objective of learning more about the consumer mindset regarding protection. How much do people know about the risks that they face and what do they feel is the best way to protect themselves against these risks? 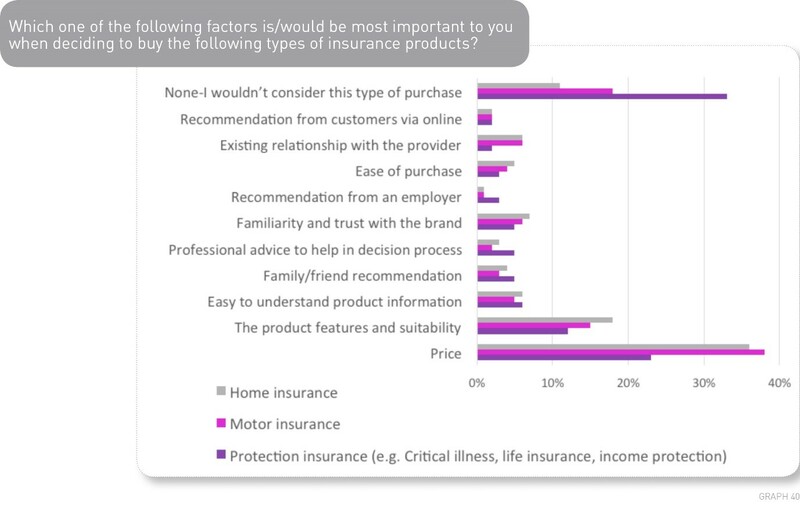 How do consumers like to research and purchase protection products and what do they think about seeking professional advice to help them with their decision? This year, The Syndicate research, carried out in conjunction with Opinium research, launched in June with an event at the Cicero offices in London where members and invited guests learnt about what the research this year revealed. In this article we attempt a whistle-stop tour of the findings from the 2016 research. There is one finding consistent in any research on protection: not many people buy the products. Market penetration for protection is disappointingly low and The Syndicate sought to identify the reasons that people don’t buy. Price was named as the number one reason by survey respondents. This is consistent with previous findings in research by The Syndicate but is of particular concern given how little consumers, and potential consumers, really know about the cost of protection. The Syndicate has asked people to estimate this cost in previous research and asked once again this year. Although the figures were slightly less over estimated this year they were still wildly inaccurate and suggest that people assume that protection is far more expensive than it is. This is undoubtedly behind the suggestion that people don’t buy because of the price. The findings in the research from The Syndicate this year corroborated much of what we have found in previous years, namely that price is not the only issue. It is more than the cost of the monthly direct debit that people have difficulty with, it is also feeling that the spend represents good value. Many of the answers that people gave this year when asked why they didn’t buy protection related not only to price, but also to perceived value for money and also a feeling that the product may be completely unnecessary in the first place. This attitude has been identified in previous research where we referred to it as the “casino mentality”, whereby people are prepared to discount the risks that they face in the hope that “it won’t happen to me”. When people were asked to provide the reasons that they lapsed protection policies the answers given were remarkably similar, almost identical to the reasons that people didn’t take out cover in the first place. This highlights the need to convey the full value and benefits of the product both at the point of sale but then also throughout the life of the policy in order that the price paid is not resented by those with the cover. Purchase triggers: why do people buy? Having established that people say that they don’t buy protection largely because of price and value, we next sought to establish why those who do buy protection products have made that decision. The survey results revealed that the most common triggers, according to consumers themselves, are the arrival of children and the purchase of a house. The adviser research that The Syndicate undertook this year asked the same question of our adviser panel who identified the same top two triggers for purchase although they felt that house purchase was slightly more likely to prompt a purchase than the arrival of children. Regardless of this, it is clear to see that these two life events are of major importance to insurers. The challenge is, and will continue to be, how to stay close enough to customers, and potential customers, to be able to have relevant conversations at the poignant moments in their lives. In addition, with these life events likely to occur later in people’s lives now with the average age of parents at the birth of their first child, and the average age of first time buyers on the increase, there is a generation of people who will not begin to consider their protection needs until they are much older, leaving them vulnerable until that point, despite potentially having protection needs even as renters. We next asked what was important when people bought protection and once again price was the dominant theme in the answers given. A comparison with home and motor insurance as part of this question allowed us to see that this was also a feature of other types of insurance and not something unique to protection. Product features and suitability scored second highest in the answers given which is pleasing given the overwhelming focus on price. The process of researching and buying protection did not appear to be a memorable one for many of the respondents with the largest majority saying that they couldn’t remember how they had researched their policy. After this, aggregators proved to be the most popular research method for respondents followed by advice from a financial adviser or broker. When purchase was considered, comparison sites slipped to fourth most popular method with direct from the provider taking top spot followed by via a bank or building society and then via an IFA or broker. Face to face was the most popular way to make a purchase for those that The Syndicate asked but online via a laptop came a close second although it was interesting to note that once again many couldn’t recall how they had bought their policy, suggesting it was a purchase that they felt they had to make rather than something they particularly wanted to do. What is interesting to note in the research findings this year is that the behaviour and preference of the youngest respondents was markedly different from their older counterparts with 18-24 year olds expressing a much stronger preference for using tablets and smartphones in the research and purchase process than anyone else in the survey group. We’ll return to these findings later in this article when we consider the implications for the industry of a distinct group of consumers with unique preferences. With technology a theme in the answers given with regard to research and purchase of protection methods, we considered the role it currently plays in peoples’ lives and how this might begin to affect their interaction with insurance. 77% of the sample for The Syndicate research owned a smartphone and when we asked about the usage of apps on smartphone we found a consistency in the popularity of certain types. Messaging apps were the most popular type of app amoungst all demographics followed by banking and retail apps. With the proliferation of banking apps showing that financial services and can and does exist in the digital world, we wondered how widespread the use of insurance apps was. Just 5% of those asked had downloaded and used an insurance app compared to 45% for banking apps. Despite this, the patterns observable in online and app based banking are important lessons for the insurance industry particularly given the widespread ownership and use of smart phones. Still on the subject of technology, The Syndicate sought to explore the topic of wearable tech which had been included in previous research reports. Just under 30% of the sample said that they owned a wearable device of some kind which, although still a small proportion, had increased from previous research. Of those who owned a device of some kind, 14% said that they never wore it with 36% claiming to use it every day. The data in the report suggested that wearable devices were primarily used to track specific fitness tasks by those who owned them. Of course, ownership of a wearable device means little if the data that the device collects is not made use of. Those aged 18-24 were most likely to say that they regularly made use of the data that they collected on their wearable but even amoung the over 65 year old cohort, 62% said that they used the data on a regular basis. What is critical to insurers of course is not just that data is collected and made use of but that it is willingly shared as well. The research this year found that just 20% of people said that they would be willing to share data from a wearable device with insurers. 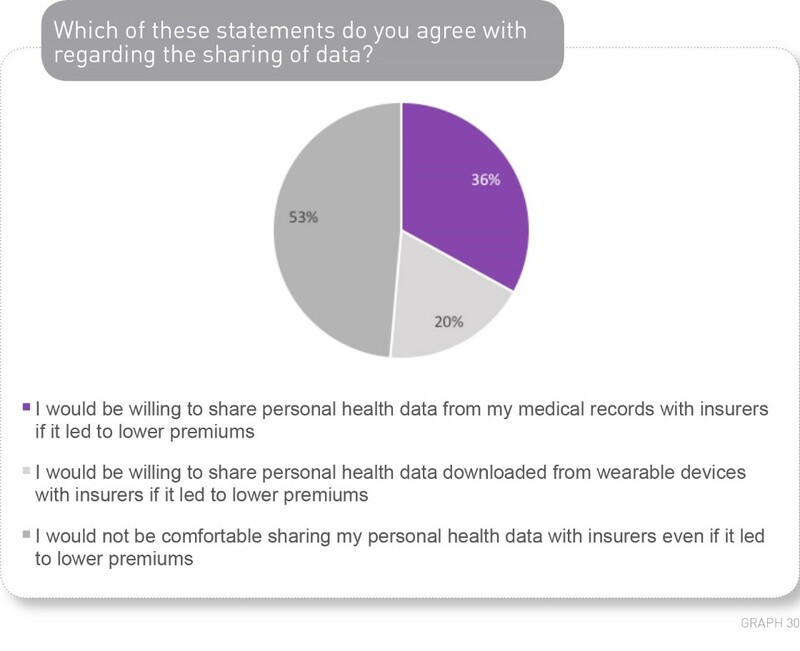 This compares with 36% of people who said that they would share data from their medical records with insurance companies. With 53% of people saying that they were not prepared to share any sort of data with an insurer, even for an incentive, the impact of wearable technology would appear to be limited for now. What is perhaps more pertinent to consider is that we will, in time, have a generation of customers who are very well informed about their own health and fitness and may regard the process of applying for insurance rather differently than current consumers. One of the main objectives of The Syndicate is to examine the consumer mindset with regard to insurance. 59% of those asked said that they liked to keep up to date with financial matters although answers to some of the other questions posed suggest that this may not necessarily include insurance. 44% of people said that they felt confident enough to make decisions about purchasing protection insurance without taking professional advice although only 24% said that they had any plans to review or increase their protection cover now compared to 12 months ago. The research also revealed a willingness to take on debt with 44% of people saying that they would not cut back on anything if faced with a drop in income due to an accident or sickness. In such circumstances, previous research by The Syndicate suggests that many people would expect to rely on any savings that they had to see them through. This year the research sought to explore how savings are viewed more favourably by consumers as a possible alternative to protection cover. 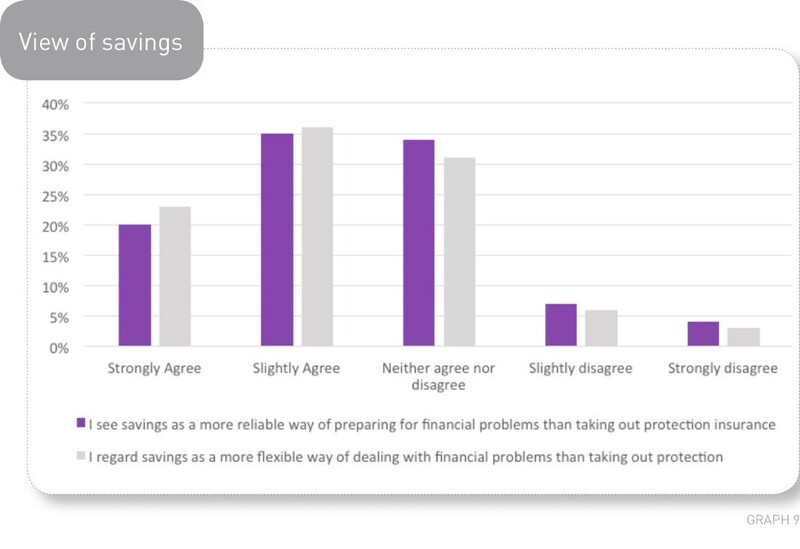 Respondents were asked whether they believed that savings were more flexible and reliable than protection insurance and the results showed that for both of these variables, the larger majority of people agreed that savings were more reliable and more flexible. With 55% of people believing that savings are more reliable than protection and 59% seeing them as a more flexible alternative, the need for the protection industry to revisit the design of protection products is evident. What can the industry do to change this perception of it’s’ products so that they are seen as a viable, even essential alternative to savings? Does the industry need to take a firmer stance in communicating the likely inadequacy of savings as a safety net for most people? Communication was another key theme of the research from The Syndicate this year with holders of protection policies being asked whether they had heard from their insurer in the past two years. Only 35% of them had heard anything but perhaps more shocking was that of the 65% who had heard nothing, 77% of them said that they didn’t want to hear from their insurer! It is hard to envisage how, as an industry we are supposed to establish an open and trusting relationship with consumers and those who may consider purchasing products if they are not interested in hearing from us! One member of The Syndicate, Thunderhead, examined this issue in more detail and their findings suggest that the key to successful communication is relevance and demonstrating that the interaction builds upon previous contact to so that offers and information are useful and likely to elicit a positive response. To do this requires that we know customers and what matters to them which could require and adjustment of approach for many insurers, but the prize must surely be worth it? It is also worth noting that the research identified a group of consumers who would not only favour such an approach, but also expect it: young people. High proportions of those aged 18-24 said that they did want to hear from their insurer, preferably by email suggesting that this needs to become a standard way of operating in the future. In the UK, the protection insurance market is in the unique position of having to compete not just against alternatives such as savings, but also the Welfare State. It provides, at cursory glance, an alternative to private provision, but in these current times of austerity, and with consistent messages from the government about welfare cuts, how many believe that the State can be relied upon in times of need? 60% of the sample for The Syndicate research did not agree that the State could be relied upon to provide. Despite this, 46% of the same sample were undecided whether or not it was a good idea to purchase individual protection cover and a further 18% actually disagreed that this would make sense. 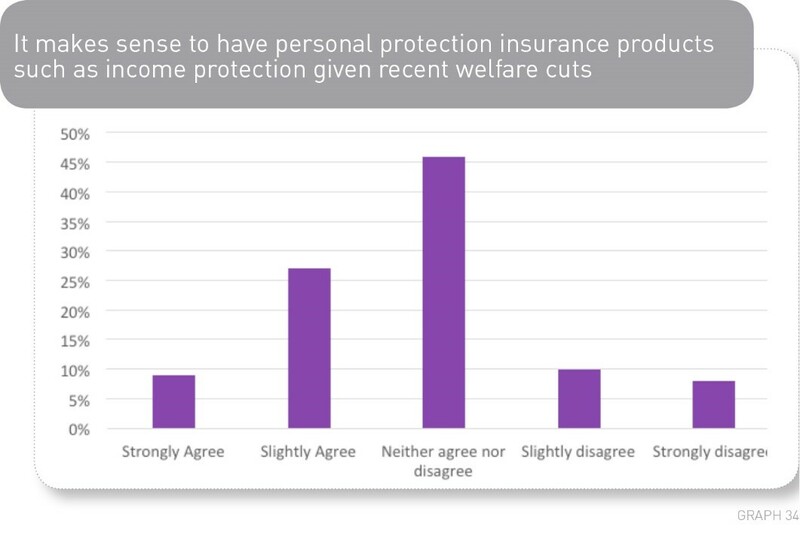 The figures suggest overwhelmingly that whilst the Welfare State may, for many, provide an alternative to protection, they are by no means the only reason that people don’t buy the products and that this can be attributed just as much to a lack of belief in the products and the promises that they make. This year The Syndicate also asked about retirement and later life plans and the extent to which people felt a responsibility to make their own provision. 73% of the group felt that it made sense to plan early for retirement but only 14% of the entire sample felt that individuals should be making their own provision. Instead, 70% of those asked felt that care in later life and retirement should be funded through either taxation or national insurance contributions. The extent to which people felt able to rely on this though was highlighted by the 13% of people who said that they had no expectations of ever being able to retire, suggesting that they anticipated a need for an income to supplement anything provided by the State. This is clearly a high risk strategy given the likelihood of illness or accident faced by people but it does go some way to explaining how people are prepared to choose an option that they don’t necessarily believe can be relied upon and look for ways to supplement provision themselves. They are clearly of the belief that the Welfare State gives them the option to be able to do this. The lessons for the industry here are around the tough messages that we have to give about the risks that people face and their likelihood of being able to cope with no plans in place. The final area covered by The Syndicate research this year was the issue of advice. The research sought to establish consumer views of professional advice but also spoke to a panel of advisers to ascertain their views on the value that advice adds to the process of purchasing protection. The survey presented respondents with the FCA’s four tier definition of advice and for each tier asked people to say whether they felt that it referred to advice or whether it was a scenario where the individual was still responsible for their decision. Not one of the definitions was considered advice by more than 50% of the sample and the definition most likely to be considered advice was “Advice with a personal recommendation which considers the full range of my needs, including debt and protection”. Whilst the survey group were not certain about the definition of advice, there was more agreement about the necessity, or otherwise, of advice. 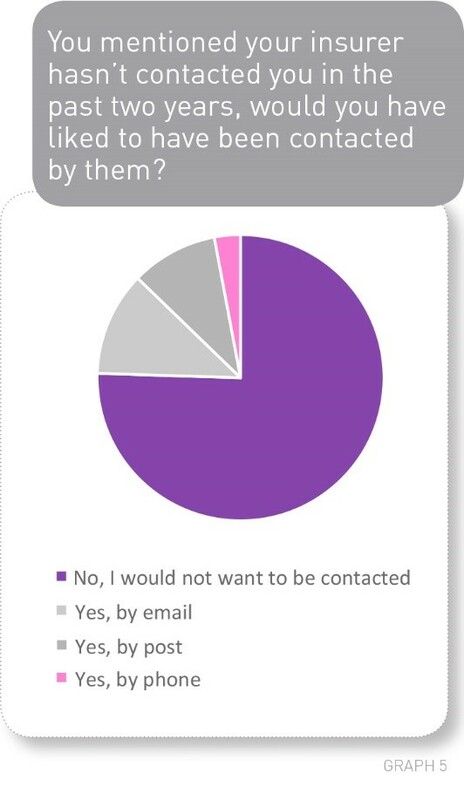 42% of respondents said that advice was not a necessary part of the advice process. However, later in the research, the same proportion (42%), agreed with the statement that “Professional advice was worth obtaining as the result is that the right cover is purchased”. In both cases, the majority were unable to agree that advice added value to the purchase process. The message for the industry with regard to the need to effectively convey the value of advice is clear. This year, The Syndicate also considered alternative forms of advice and tested the extent to which these would be valued and trusted by consumers. 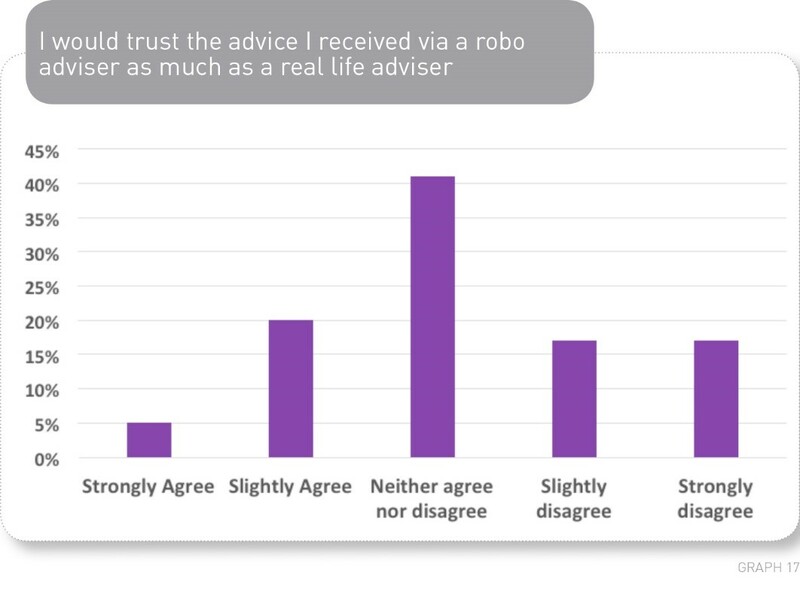 55% of people suggested that they wouldn’t use Robo-advice and only 25% said that they would trust it. Advice from a website fared slightly better with 31% saying that they would trust this. However, 45% remained undecided. It would appear that although advice is not widely recognised or valued, a face to face interaction is still valued more than advice via a less personal source. This was not true of all demographics though and once again the youngest cohort expressed difference preferences showing higher levels of trust in new forms of advice that utilise technology. Advisers were, unsurprisingly, much clearer on the value that advice adds for consumers, and when asked to clarify this, the largest majority said it was explaining the client’s degree of financial vulnerability and prioritising their needs. A review of protection needs should take place every three years according to the largest majority of advisers, although for business protection, a review was necessary on an annual basis, according to the majority of the panel. Finally, the advisers who took part in The Syndicate research this year were asked for their views on the much debated issue of commission levels and the largest majority felt that levels were about right as they are. Research by The Syndicate this year and in previous years has demonstrated that people do not like to think about why they need to purchase and, even if they can be persuaded to do so, they often forget about or disengage with their purchase after it has been made. As an industry, it has to be said, we allow this to happen. Contact with policyholders is infrequent and the value and benefits offered by a policy are not heavily publicised. Although efforts to manage reputation have been attempted with the publication of claims statistics, this information is not necessarily reaching the end user, and there are few reminders of what has been purchased once the policy has started. It is also clear that the need to buy protection is not evident to many people, and awareness might roughly correlate to the effort and actual spend on highlighting this need. The research this year has reinforced that for consumers, sadly, the emphasis is very much still on price. It was cited by the majority as the most important factor when choosing their insurance and was the most likely reason given to not purchase in the first place. In keeping with these findings, we found that aggregators were the most popular method of researching protection insurance. This does little to take the focus away from price, and the challenge for the industry is how best to effectively convey all the benefits of insurance and everything that is provided in addition to the policy. Without the emphasis on the emotional support that protection can provide, in the mind of the consumer, the alternatives to protection appear more attractive. Once again this year savings have been judged to be more flexible and reliable than protection insurance. Above all, they provide certainty and are trusted by consumers. The industry must take steps to address the doubts in consumers’ minds: will the claim be paid and am I wasting my money if I don’t need this product? Numerous studies, including past research by The Syndicate have shown that savings are rarely adequate to provide support long term, particularly given their dual purpose for many, but we do little to highlight this to potential customers. One of the biggest challenges for the industry is what The Syndicate refers to as “the mass indifferent” , a group that show no interest in engaging with insurance products and who do not like to think about the risks that they face. It is difficult to know how this group may best be motivated to consider the benefits of protection but clear messaging about the benefits of cover alongside a demonstration of the potential disadvantages of other strategies must surely be a good way to start. While advisers were very clear about the value they could add for consumers and the importance of their role in the research and purchase of protection, consumers were a little less certain. There was confusion over what constituted advice (and here the industry and regulator could undoubtedly do much to help) and not a clear view on the value that an adviser could add. Our sample were often confident that they knew enough to make a decision about purchasing protection independently. There was also little appetite for robo-advice although online advice from a website was trusted a little more by sections of the sample. Our adviser research revealed that a house purchase is still the most likely trigger for the purchase of protection and this is significant given that the age of first time house buyers is on the rise. Does this mean that people will start their relationship with protection insurance even later and if so, how can we reach people earlier on and demonstrate the value of protection for everyone, not just homeowners? Recent welfare cuts point to a society where the Welfare State will not be the safety net that it has been for so long, and the message seemed to be reaching our sample. But although there was an acknowledgement among our survey group that it was unwise to rely on State benefits, this realisation does not necessarily translate into buying behaviour as market penetration figures illustrate. Despite that, this year’s research showed that the majority of people agreed it made sense to plan early for retirement. The Syndicate research this year has highlighted how the opinions and expectations of the sample group have differed with age. The result of this is a generation of future customers who are more trusting of insurance and acknowledge the need for it, who are confident to do their own research and receptive to case studies, particularly from those that they know. This “online” generation are not necessarily financially savvy and many will face debt issues but they are the customers of the future. They expect and welcome communication with their insurer, they are confident interacting on a tablet or smartphone and happy to seek out advice from friends or family, online, or even to potentially consider robo-advice. They are unlikely to have had a negative experience with an insurer and be tainted by the previous mis-selling scandals which have tarnished the industry’s reputation for older cohorts. They are the cheapest to insure and to serve, have the least health issues and might be sold protection in a much simpler way. However, they are likely to encounter aggregators online and soon their attention will turn to cost rather than value. They will have high expectations of personalised service from providers and will expect to be able to interact with simple products via a range of digital channels. To maximise the opportunity to reach these future customers the industry must act swiftly and prepare to meet the needs of tomorrow’s customer. It is often said that age is just a number, but in this scenario it is a very real opportunity. We must be proud of the difference our industry makes and we must be certain that consumers understand this pride and the reasons behind it. To do so requires a considerable, multi-channel, sustained effort on behalf of the industry but the payback will undoubtedly be worth it. With the Welfare State shrinking and the population living and working longer, the risks of not doing so are too great to consider. This year, The Syndicate members include AIG, Aegon, Cicero, Hannover Re UK Life Branch, LV=, Scor, SunLife, Thunderhead, Vitality and Zurich.